were hanged… it was hemp cord. to all who fight dictators. 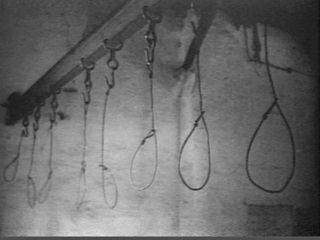 execution room where they too were hanged or beheaded. If you check Erwin von Witzleben wikipedia page you will find the explanation. Veel samenzweerders van het Julicomplot in 1944 waren aanvankelijk aanhangers van Adolo Hjtler geweest. Omdat hij Duitsland ten gronde richtte kwamen ze in het geheim tegen hem in opstand maar ze kregen daarin geen steun van de geallieerden die (ironisch genoeg) in het begin Hitler evenzeer onderschatten! Het Duitse verzet was, net als overigens het europese verzet, hopeloos verdeeld en lang niet alle verzetsstrijders per definitie helden! Wie echter voor het Volksgerichtshof belandde kon zijn/haar testament alvast maken want Roland Freisler, de nazi-rechter, zorgde ervoor dat iedere Duitse anti-nazi een enkele reis kreeg richting de galg, guillotine of een concentratiekamp! Nou kan ik alleen maar gissen wat er met Claus von Stauffenberg was gebeurd als hij voor Freisler had moeten verschijnen, in tegenstelling tot zijn broer Berthold, zijn oom Nicolaus von Uxküll-Gyllenband en zijn neef Cäsar von Hofacker. Zou Freisler dan Stauffenberg gruwelijker hebben uitgehoond dan zijn vrienden en hem langzamer laten sterven aan een vleeshaak met een pianosnaar om zijn nek? Grimmig genoeg had Freisler één van zijn beroemdste slachtoffers, Erwin von Witzleben, ontmoet in 1940 toen deze tot veldmaarschalk was bevorderd door Hitler! Freisler was toen zelfs erg onder de indruk van Witzleben geraakt die later zijn grootste aartsvijnd werd, net zoals Maximilien Robespierre dat werd van koning Lodewijk XVI voor wie hij eens een Latijnse rede voordroeg! All respect to your uncle, Elke. Your family paid a very high price for doing such a brave thing but you can all holds your heads high, unlike many others. Good for your uncle, Elke! It took a great deal of courage to stand up to the Nazi’s in that wonderful and covert plot to kill the monster, Hitler. One of my German uncles was a co-conspirator with Roland von Hösslin (who was executed on October 13th, 1944 for his part in the plot against Hitler) and was in the same room with von Hösslin when the latter was arrested. Many of the men who wanted Hitler removed were not only military men but also theologians who belonged to the “Bekennende Kirche” which did not want to align itself with the official Lutheran Church and thus not with Hitler’s “programs.” These men knew that after Stalingrad there was no hope and they wanted Hitler out of the way so that not only the lives of millions of Germans would be spared the ravages of a prolonged war but also the lives of people in other parts of Europe. One of the commentators above is absolutely right: you cannot judge these brave men’s actions with hindsight. Hitler’s insanity did not only impact the lives of Jews and other “undesirables” (as Hitler put it) but also the lives of ordinary people such as my family. We lost everything when we had to flee from East Prussia: our home, our homeland, everything my parents had worked for and many family members and relatives. Thank you, Blk Army Vet! Few recognize or accept that there WERE Germans who fought against Hitler. Most today judge all Germans of that time to be as evil as Hitler. From 1939 (and even before) onward, many tried to stop the Nazis. Because they were too few and too scattered, they had no hope of success. Yet they persisted, and the majority died. These men were brave. There feared Hitler more than they feared the Allies but they still with against all odds like Davy Crockett to bring him down. It takes a special person to fight and die for something that they believe (excluding muslims who blow themselves up like fanatics) I’m a true American but I have the upmost respect for all of those Germans who risked their lives to fight adn stand against Hitler. Built by Hitler, certainly. To the extent they are today, no. And vehicle ownership (thanks to Volkswagen) was on the rise but by no means universal in the greater body of Germany. However, and this is my point: Individual villages, towns, provinces, etc. were still isolated by today’s standards. Rail and horse were the most common modes of transport. The population of East Prussia, for example, was over 90% peasant/farmer (Bauer) in a pre-war census. Cities were a world unto themselves. Information was not quickly disseminated and was often treated with suspicion until verified. Therefore we cannot accurately judge the actions of any of the plotters by today’s standards or in light of evidence we have now that was not publicly available in 1944. Excuse me, but the autobahns certainly were built by Hitler as his “gettiing people back to work” drive. MajorLemon: I respectfully wish to correct your comment. There were many attempts to remove Hitler from power for many reasons, from the fact he was Austrian to his final solution to his bungling attempts at military genius. These individuals acted to protect their country, not out of a 21st century, post-war, information-soaked outrage about the Holocaust. Remember: neither the Internet, nor mass media, nor the Autobahn existed in Hitler’s time. Travel & communication were quite limited; not everyone was aware of the extent of the killings. As for the Holocaust itself, the Jews suffered most in the sheer number, 6 to 8 millions slaughtered. However, they seem to ignore the remaining non-Jewish 6 to 8 millions slaughtered and in fact object, sometimes violently, if reminded of the non-Jewish portion of the Holocaust. I believe it was Auschwitz that hosted a Jewish-led altercation started because a number of Jews, praying for their dead, were outraged at a number of Catholics there praying for THEIR dead. And thus the violence. Hitler slaughtered those he did not want cluttering his perfect world: Gypsies, homosexuals, political dissidents, the mentally impaired, non-Germans, jazz lovers. The vast majority of the July plotters acted only because they knew the Germany was about to loose the war, very few of them were motivated concerning the Holocaust perpetrated against the Jews which was Hitlers sole everlasting historical achievement and his most ghastly crime.